When Agy invited me to join the Making Good Blog Train and share my own repair project I initially planned to work through a bag of clothing items that needed minor repairs, replacing a button, reattaching a cord to tie a closed a cardigan, restitching the underarm on a top where the stitching had given way. When I went through that bag to fix those items I realised only the black cardigan with the missing button still fitted me and I didn't really want to write about stitching on a button. Besides black is really hard to photograph so you probably wouldn't have seen much anyway. Instead I decided to fix something that I have already shared with you and not yet taken any action to fix. This is in keeping with my goal to work my way through unfinished objects (UFO's) to reduce the clutter in my life. Since crocheting the bag it has been damaged and repairing stuff is what the Making Good blog train is all about! The first thing I needed to do was find the right materials to repair it with. I didn't want to go and buy anything. I was sure that I could find something that would be perfect for the job. I ended up finding another UFO. A tablet weaving project I started goodness knows how long ago. The colours were fairly neutral and should look okay with the bag. The yarn was wonderfully soft and I knew I would never finish the weaving so this was just the right project to get this UFO out of UFO status. To remove the cards I cut the yarn just after the cards which allowed me to separate the project from the yarn and slide the cards off easily. It really needed a wash so I tied the loose threads together to stop them from tangling and hand washed it in cold water with wool laundry detergent. While I waited for the yarn to dry I had planned to remove the damaged shoulder strap from the bag. However my bag had been stolen by Geri The Wonder Dog. How could I disturb that cuteness? It was easy actually. I whipped that bag out from under her. She looked at me with an expression somewhere between confusion and annoyance then went straight back to sleep! While Geri snored I removed the shoulder strap. Once the yarn was dry I crocheted the new strap in place using repeated rows of double crochet. Each row is 11 stiches wide and the lengths of yarn were long enough to do 2 rows each. I went with a wider finish for the shoulder strap this time so it would be more comfortable if the bag had heavy items in it. Making the drawstring was the most frustrating part of this repair. At first I had planned to use the remaining yarn scraps from the tablet weaving to make a drawstring but it quickly became apparent there would not be enough yarn. 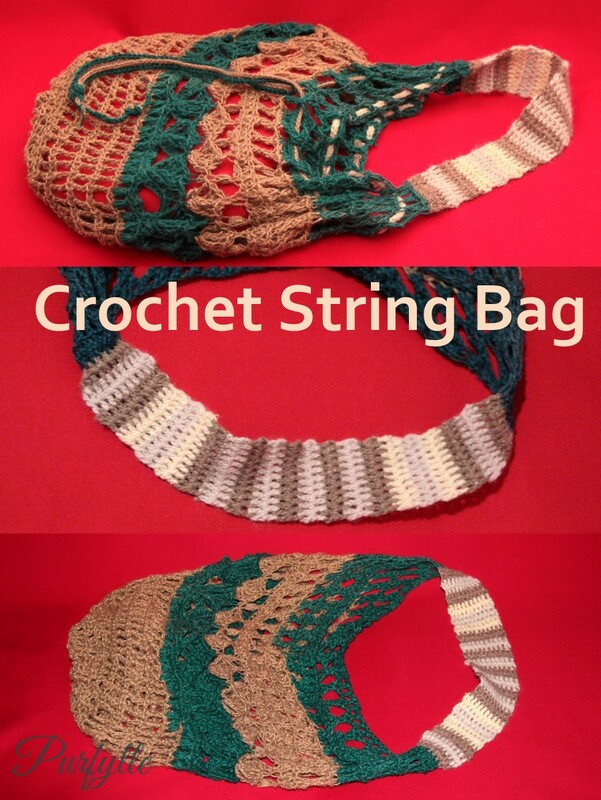 Instead I crocheted a decorative double foundation chain with the yarn scraps which I wove through the top row of the bag to tie the jute and yarn colours and textures together. For the jute drawstring I tried a half double crochet strap, a double crochet strap, a strap with a mixture of both and I was not happy with any of them. In the end I settled on the following method of making the drawstring. To begin I crocheted a double foundation chain using the natural coloured jute. When the chain was the length I wanted I switched to the green jute and single crocheted along the length of the double foundation chain. It was a nice simple solution and I really like the contrast of the two colours. I've learnt a lot about crochet since I first made this bag. I would make it again but I would make quite a lot of changes to the pattern (which I totally made up as I went) and I would use a much softer fibre. This post is part of a blog train hosted by Agatha from Green Issues by Agy on "Making Good". What is repair, and why do we even bother to repair the things we have? Some see repair as a way of reconnecting with our possessions as we extend their lives. Others see it as a form of creative potential and an avenue to express their craft. The rewards for mending varies from feeling immense satisfaction to prolonging the life of the product. Click here for a list of all the participants in the "Making Good" blog train. Did you catch the fabulous "making good" repair over at 2 Crochet Hooks yesterday? Over at 2 Crochet Hooks you will find the lovely Millie and her awesome daughter Kristina, a brilliant mother-daughter team, sharing fun crochet and craft tutorials. Every month they host a new craft challenge, using different recycled materials and they also sell a whole bunch of unique crochet designs, including some really awesome kid costumes! I would also like to introduce you to Adeline from Accidental Mom Blogger. Adeline will be sharing the next article in the "Making Good" blog train with us on the 5th of May 2015. I can't wait to see what she makes! 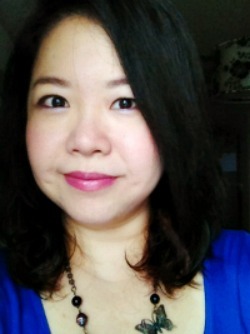 Adeline is a stay-at-home-mum and a home based jewelry artisan at Adeline's Loft, based in Singapore. Her passion and interest in creating handmade lifestyle jewelry spans over 9 years. A self-proclaimed "beadaholic", she finds immense joy and satisfaction when her clients give her free rein over styling a piece of jewelry that suit their personalities. Adeline also enjoys cooking for the family and loves dabbling with photography. Follow the "Making Good" blog train this month and see what we have repaired and reconnected with. Have you mended anything today? Yes, Geri (my dog) loves anything that is mine. She can get really possessive of some things too, but not this one thankfully. I nearly didn't fix this bag. I'm pleased I did though. I've already got it in use. awesome repair! I sometimes wish I have a gift for crocheting. :p And the photo of your dog hugging the bag! too cute. Crochet is fairly easy to learn. It's all just variations on the one stitch. You should give it a go. wow i am getting a totally new mindset from participating and reading these making good posts. My first thought was to take the bag apart and reuse the string but the bag is fine and useable, why not fix it? I love how you had to wrestle your assistants for the parts though lol. such cuties. I think the wider strap is brilliant, I hate straps that slide around or dig in, wider gives more stability. I hope you have tons of fun using this 'new' bag! The strap being softer and shorter also helped. It was one of very first crochet projects and it's full of mistakes but that's why I've held onto it. At least now it's functional! I laughed out loud when I read you did not want it on your to do list anymore! LOL! Isn't that true? It looks great and doesn't it feel wonderful to have it fixed finally? The item I am in the process of fixing would still be downstairs collecting dust if it weren't for this wonderful blog train! Thanks for sharing! Joining the blog train on May 14! Sometimes we just need that looming deadline to get it done right? This came out great! You are inspiring me to actually learn to crochet. I am always threatening and even have crochet hooks and yarn.... Thanks for the inspiration! Your having to regain custody of the bagfrom your sweet pooch was adorable. Great making good! I have really taken to crochet. I didn't think it would be all that different to knitting but I enjoy it so much more! If you've all ready got the yarn you are ready to go! Start with chain stitch, single crochet and double crochet stitches and you will be able to manage almost all things crochet! Great repair, It's nice that you were even able to make improvements as part of the repair, it's now better than ever! I hope you had a wonderful Mothers day too! I'll see you at the party. 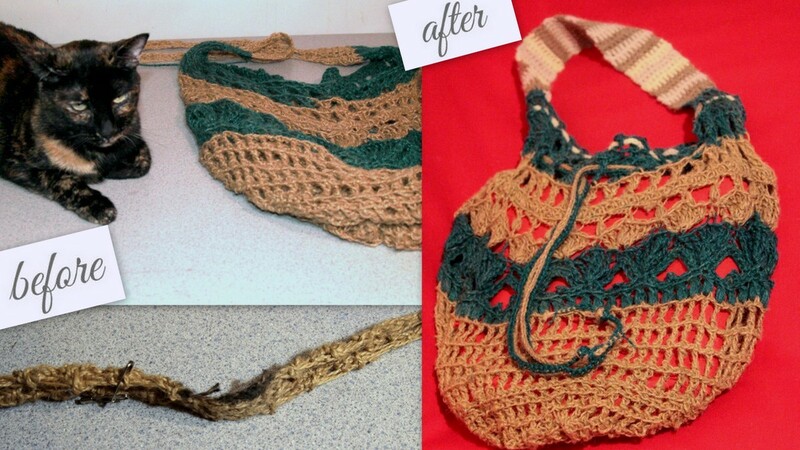 Great job on repairing crochet string bag. I love that you are actively trying to work through your UFOs. I would love for you to link up at the Stitch It, Blog It, Share It Link Party going on now at behindtheseamssewing.com. I am loving your new party! Thanks for inviting me. I would definitely fit a beach towel, wet pack, snacks and perhaps a book? Your bag turned out beautiful! Reduce clutter and gain a fun accessory! Win-win!